Thailand has been ranked in the HSBC Expat Explorer Survey 2013 as the number one place in terms of Expat Experience. The Southeast Asian country can offer a lot to expats. Firstly, a low cost of living means that many expats have a high disposable income, allowing them to experience many leisure and social activities on a regular basis. There is also the great climate, meaning plenty of opportunities to go to the beach and enjoy the sunshine, further enhancing an expat’s experience. The main point however which seems to contribute to an expat’s wellbeing in Thailand is the ease of meeting people and making friends. It is widely known that the local population are welcoming and Thailand is often referred to as the ‘land of smiles’. In addition, the current expat community in Thailand means that there are many other fellow expats to make friends with which can help expats to settle in. Other aspects of Thai culture such as the local, healthy food and the country’s interesting history are also enjoyed by many expats. In the HSBC Expat Explorer Survey, Thailand scored highest for healthy diet, travelling opportunities, social life, work / life balance, entertainment, local shops and markets, integration into the community, local culture, making friends, local weather, local food and ease of finding accommodation. Thailand’s lowest scores according to the survey were for organising schools, sports, setting up utilities, local work culture, learning the local language and organising healthcare. 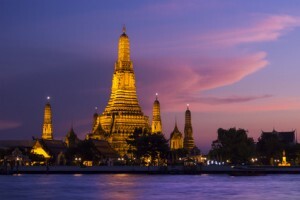 Bangkok – an exciting, energetic city of ten million people which is home to many expats. Some expats report it confusing when first arriving and there is no doubt about the pressure on the infrastructure but the vibrancy of the city still attracts many to the Thai capital. Bangkok has modern healthcare and accommodation so it can feel familiar to Western expats whilst still experiencing a new culture. 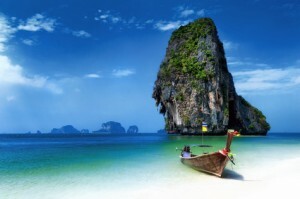 Phuket – the beautiful beaches and turquoise seas are a big draw for expatriates to this Thai island. Northern Phuket tends to attract more holidaymakers or part-time expats whereas the Southern half of the island attracts more permanent residents. Koh Samui – a small isla nd which can be driven around in about two hours. Relocating here allows expats to enjoy the beach resorts and stunning views although some expats prefer a more lively destination. Chiang Mai – a generally economic place to live which low cost accommodation which appeals to many expats and it is a great place to experience Thai culture and festivals such as the Yee Pink Lantern Festival and Songkran and there is a thriving expat community here. It’s not surprising why Thailand has topped the league table in terms of expat experience and why many people who have holidayed in the country decide to relocate there as it has a lot to offer in terms of quality of life for expats. Further information about living in Thailand can be found on the HSBC Expat Explorer Survey website.